Adopt this World Charter of Free Media, as the result of our collective reflection initiated in 2013, and as an expression of our resistance, and our commitment to just and emancipatory communication, in accordance with the evolution of our world and our humanity. => If you want to sign and endorse the Charter, please write us a mail to charteATfmml.net indicating your name and organization. 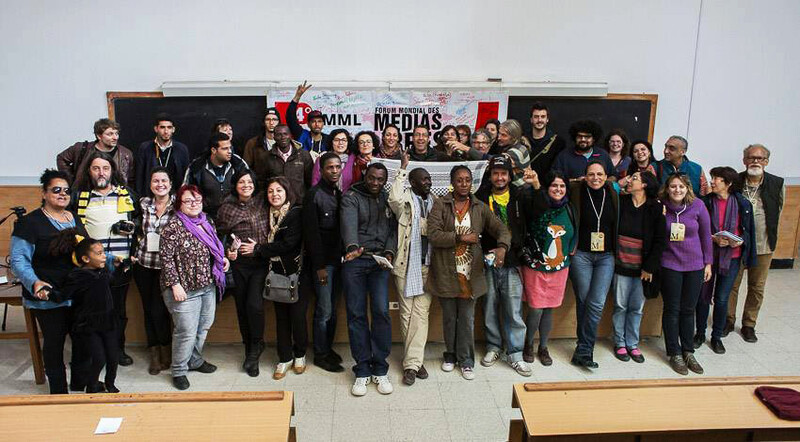 We are communicators, activists, journalists, hackers, community media associations and free media, social movements and popular organizations. We are bloggers, audiovisual producers, free and open technology developers, associations, networks, unions, journalism schools, research centers on information and communication, and NGOs supporting access to information and communication. We are individuals and collectives, professionals, amateurs, and enthusiasts participating in the democratization of communication from the local to the global level, affirming that democratization and the right to communicate for all are essential if we are to build a just and sustainable world. Since the beginning of the anti-globalization movement, we have worked hand in hand to create a space of expression for social movements. The World Social Forum (WSF), which includes thematic and regional forums organized around the world since 2001, works as a space of convergence and cooperation echoed by free media. Our network of activists appeared in this dynamic and has evolved into an organized movement for freedom of expression and the fight for another form of communication. We will continue to cooperate with other movements to transform the global communication system, making communication a political issue for everyone. We practice new forms of human communication that are intercultural, horizontal, non-violent, open, decentralized, transparent, inclusive and shared, through tools and forms of multiple expression (radio, television, audiovisual media, Internet, etc. ), experimenting with new ways of organizing and producing information. Our sources of funding, if they exist, do not determine our ways of communication and our editorial policies. The dialogue between our diversities has taught us to better understand our strengths, our contradictions, our common ethics, our sensitivities, our practices and our willingness to fight and struggle for independence. Meetings held since 2013 have allowed us to develop a common plan of action and strategic goals. This Charter marks the culmination of this process as a new starting point from which to continue building an emancipatory movement among activists concerned with information, communication and technologies. We find that knowledge production and dissemination of information by hegemonic media are subject to political and economic powers. Commercial media reproduce a system of values and forms of understanding the world, widening the gap between the actual needs of companies and already excluded marginalized social groups. During the last twenty years, with the (rapidly increasing) concentration of the media and the development of transnational telecommunications networks in all regions of the world, the power of traditional communication activists has grown. The mainstream media continue to construct hegemonic meanings, subjectivities, and public opinions. They cultivate a logic of cultural and linguistic commodification and are destabilizing factors in different regions of the world. More profoundly, we see that the communication patterns of hegemonic media exacerbate the world’s cultural and political problems. They homogenize and monopolize wherever we should value diversity, encourage participation, and promote collaboration for co-construction of knowledge and mutual understanding of the world. They are organized around special interests (infotainment or sensational events) and commercial values wherever we need to understand the social processes in their context, and promote general interests and social values. Facing this hegemonic system, communication activists and civil society have historically relied and continue to rely on free media in their struggle for real democracy and social justice. Free media promote other voices and oppose the hegemony of discourses using non-commercial and non-governmental platforms (such as community radio stations, independent TV channels, newspapers, blogs and social networks, music, street art, etc.). With the advance of new information technologies and communication, especially the Internet, in recent years we have seen the emergence of new opportunities for sharing and disseminating knowledge in virtually every country in the world. More and more groups defending free media and their increasing interconnection reinforce our desire and ability to work together across borders and different forms of media expression. We note that civil society appropriates these new technologies to create independent radio and television on the Internet, blogs, social networks, platforms sharing audio and video files, digital newspapers and magazines. These techno-activists develop free software and web interfaces, and offer real alternatives to commercial software and services. 1. We affirm that freedom of expression for everyone, the right to information and communication, and free access to knowledge are fundamental human rights. The right to communicate is the foundation of our humanity and our ability to create community. People have always looked for ways to communicate freely and independently, regardless of the historical oppression exercised by dominant groups through the media in our societies. 2. We affirm that democratic information and communication is a fundamental condition in exercising democracy. Redistribution of speech, communication and action by the free media should not be limited to technical or deterministic questions. Fundamental both for our movements and for the whole of society, the free media are primarily a political question. 3. We affirm that information and communication are essential tools in mobilizations and struggles seeking respect for human rights. 4. We affirm that information and communication platforms are common assets. Their use and management should address the concerns of general interest and pluralism, prioritizing popular participation. This entails eliminating the imposition of market ideologies and recognizes new areas of communication beyond the private and public sectors. The action of the free media is based on the goal of independence vis-à-vis the control exercised by the state and the economic, political, ideological, and religious powers, and the communication conglomerates. We distance ourselves from for-profit and market logics that characterize the hegemonic media. We stand in solidarity with social change, ecological and economic justice, and democratic efforts in different parts of the world. Our struggles are an essential part of the fight for human rights and the struggle against colonialism, occupation, patriarchy, sexism, racism, neoliberalism and all forms of oppression and fundamentalism. We are opposed to violence on the Internet and in the media, particularly gender-based violence, and violence towards sexual minorities. Our means of communication attach great value to the diversity of expression and understanding of the world, tolerance, and the equitable distribution of speech and power. We promote social participation, cooperation, and the sharing of information among different media and between information producers. We fight against all discourse promoting hatred, intolerance, and violence. We highlight other ways of living, other representations of the world and we encourage new forms of participation and political engagement. The free media seek to train people to use a critical reading of the media from a popular education perspective. We assume the duty to rebalance the information flows between all countries of the world, and within countries themselves, creating democratic public spaces that embody an ethic of respect for the privacy of information. We know how important it is to respect the cultures, memories, histories and identities of the peoples of the world. Our work allows us to hear a variety of interests in society, the voices and actions of indigenous peoples, discriminated minorities and social groups oppressed because of their religion, identity, sexual orientation, class, disabilities, ethnicity or language. The content we promote acknowledges the diversity of imaginations, identities and cultural expressions, as opposed to building aesthetic standards and gender-based behavior imposed on people. We will not contemplate any form of discrimination or gender oppression, or exclusion of any minority in the world. In a context of convergence, our free media work to achieve technological sovereignty. They reject the commodification of digital identities and promote the sharing of knowledge through the use of free licenses and open software. 1. We affirm the right to communication as a fundamental right. 2. We defend the Internet as a common good. 3. We promote democratic regulatory frameworks by advocating the development of independent organizations and agencies, especially against hyper-media concentration. 4. We call for and encourage the development of community media, reserving and assigning frequencies dedicated to the social sector. 5. We strengthen the independence of public service broadcasting (or public media) vis-à-vis government and market interests. 6. We encourage the use of languages ​​and dialects in the various areas of media expression, paying particular attention to minority languages. 7. We assert the implementation of public policies to strengthen free media, their quality and sustainability. 8. We reject the monopolization of Internet infrastructure, data grabbing by corporations, and the monitoring of cyberspace. 9. We advocate the establishment of democratic Internet governance policies including a guarantee of network neutrality, the right to network privacy and freedom of expression in the social networks. 10. We facilitate access to free and open technologies. 11. We encourage universal access to communication and broadband Internet. 12. 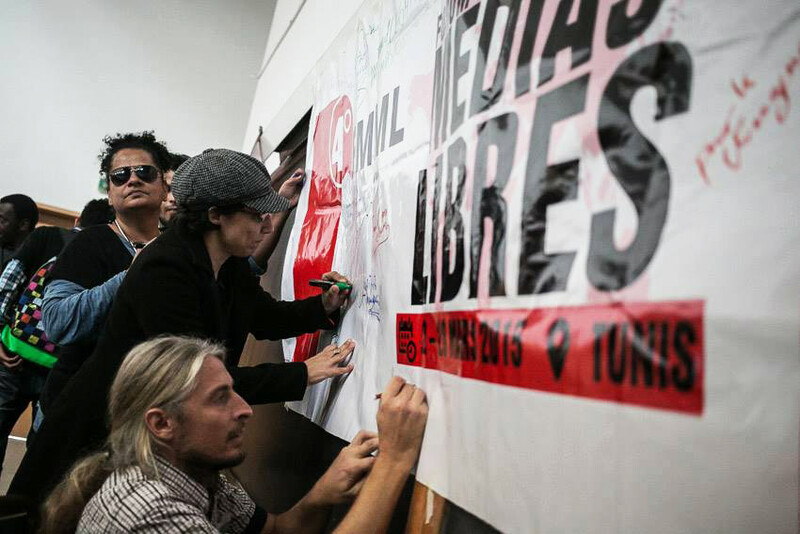 We fight against the criminalization of activists and organizations who implement free media. 13. We protect journalists and all communication activists subjected to violence, persecution or exploitation. 14. We mobilize and create links between different media and social movements, particularly in the context of the World Social Forum process. Use this Charter to advocate for free media at the national, regional and international levels. Implement the Charter as a teaching and learning tool, by organizing debates and discussion forums on free media and Internet. Build partnerships with other social sectors and international activists to promote and defend the principles set out above. Map free media to facilitate various information sharing initiatives and experiences while respecting the principles of free association and the right to anonymity. Implement the Charter to generate instruments, tools or mechanisms concerning thematic or regional levels. Promote the principles of the Charter among free media in every region of the world and on the occasion of various intergovernmental or international events among civil society. We, the free media, are aware of our strengths and the critical role we are required to play and pledge, here and now, to fight for the principles and commitments set out above, until they become a reality. Signatories (if you want to sign and endorse the Charter, please write us a mail to charte@fmml.net indicating your complete name and organization).